Service of Songs & Tribute Thursday 7th April 2016 4pm-9pm Koga Studios, 2 Bolaji close Off Kudirat Abiola Way Alausa Ikeja..
Funeral: Friday 8th April 2016 10am Four Square Church Norman Williams Off Keffi Street Ikoyi BURIAL GROUND Ikoyi Cemetery Nomoreloss died after a short battle with a chest infection Nnemonia, he leaves behind his beautiful daughter, Motunrayo Oshinuga. Thank you for your calls & well wishes. 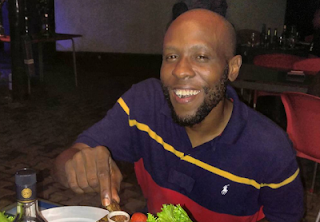 ABOUT NOMORELOSS OLUMIUYIWA OSINUGA aka NOMORELOSS was born in Lagos western Nigeria in the 70's. He attended A.D.R.A.O . International school for his secondary and primary education in Victoria island which is a high brow area in Lagos Nigeria this played a great part in his appreciation of classical music as well as music of international flavor. He had the privilege of studying the rudiments of music from one of Nigeria's greatest instrumentalist and jazz saxophonist KUNLE AJAYI. He started out in the world of entertainment as a rapper while in high school and later on switched to master of ceremony at various events. An accomplished stand -up comedian, mc, musical video director as well as a television host.